An amusing piece of scientific curiosity. Dipping Drinking Duck - reduced due to damaged boxes. Contents are new and intact. Have you seen the Thirsty Duck before? If you have, do you know how it works? 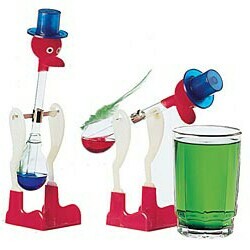 Essentially it’s a duck that drinks water continuously by dipping its head back and forth. The remarkable thing is that there’s no power source. At least there doesn’t seem to be one. 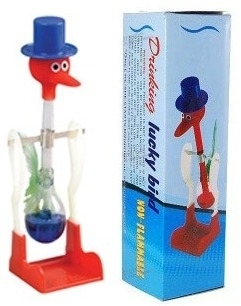 A drinking duck or bird consists of two glass bulbs joined by a glass tube (the bird's neck). The tube extends nearly all the way into the bottom bulb and is attached to the top bulb but does not extend into it. The space inside the bird contains a fluid, usually colored. The fluid is methylene chloride. Formerly trichloromonofluoromethane was used. Air is removed from the apparatus during manufacture, so the space inside the body is filled by vapor evaporated from the fluid. The upper bulb has a "beak" attached which, along with the head are covered in a felt-like material designed to absorb water. The whole setup pivots on an adjustable crosspiece attached to the neck. When water evaporates from the felt on the Dippy Bird's head, the head is cooled. He bends forward submerging part of the beak in the cold water and reduces the temperature of the liquid..